“I recently had surgery and cannot use my existing bathroom” said the voice on the other end of the line. Until now, situations like this would require sponge baths or a bathroom remodel. We now have a new product on display that allows individuals to shower in their bedroom/living room/kitchen! This product by Shower Bay sets up in about 10 minutes anywhere in your house. With a garden hose attached to a sink faucet, an individual in a wheelchair can roll into the shower, close the doors and shower. There is a holding tank for the shower water that can then be pumped out into a sink after the shower is finished. 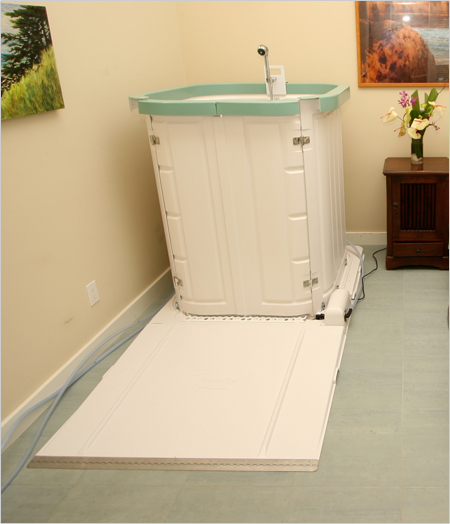 Amazing freedom for those who cannot otherwise enjoy a warm shower in their existing bathroom!